I have updated this old slow cooker lamb curry recipe of mine that I originally had in the slow cooker thread. I made it last night with a few changes and I took a photo. This time I browned the leg of lamb whole and placed into the slowcooker and just scooped the bones out before serving. Much easier then dicing up a leg of lamb first thing in the morning! I also served mine with cauliflower rice and cucumber raita so I will add instructions for them as well. You can also add some coconut cream before serving to thicken it up, up to you. I put this one together today, it was REALLY good and the house smelt really nice all day! 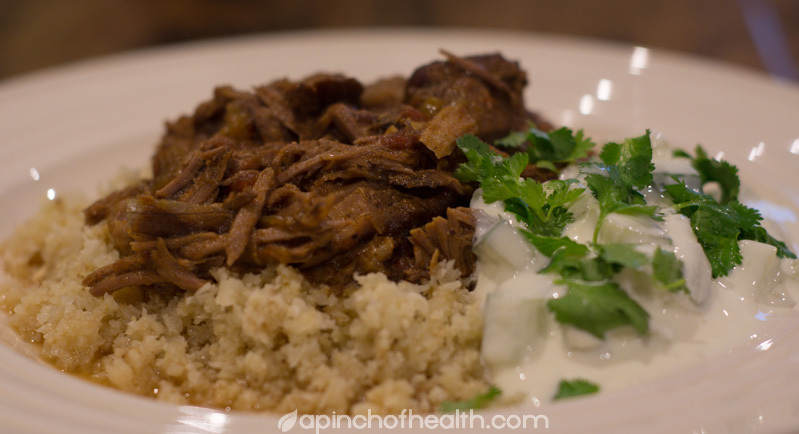 Brown lamb in batches or score a leg of lamb and brown all over then chuck in slowcooker. Fry curry paste and cumin plus a bit more butter/oil if needed in the same pan for 1 min then add onions and garlic and saute until soft. Chuck in slowcooker and stir into lamb. In the same pan add chicken stock, lemon juice, tomatoes, cinnamon stick curry leaves and seasoning and bring to boil. Add to slowcooker and combine with rest. Just before serving, process cauliflower until resembles rice then pan fry in butter/oil for 5 or so minutes until soft and fluffy and set aside. Combine cucumber with sea salt, yoghurt and lemon juice to desired consistency, keeping in mind that the lemon juice will thin the yoghurt. Place in serving bowl and sprinkle fresh coriander over the top. You can add chiili and cumin if you wish. If not using the raita, serve with fresh coriander, lemon wedges and greek yoghurt, plus whatever low carb side dish you want some sugestions are cauliflower rice, mixed carrot and cabbage mix like coleslaw but without the dressing lightly panfried or spaghetti squash. The post was edited 1 time, last by Sherrie ( Mar 26th 2015, 2:51pm ). Hey I should mention I made this again last week but I omitted the tomatoes and replaced with pumpkin. I also replaced the chicken stock with a can of coconut cream and I had no curry leaves. This came out REALLY REALLY GOOD and was very thick and gravy like. Very moorish! I used up some cucumbers out of the garden and made a cucumber raita which was just natural yoghurt, lemon juice, cucumbers, salt and fresh coriander. I didn't see the point in adding spices to the raita as there was plenty in the curry. Going to try Sherries modified lamb curry, Prob Monday, sounds Yum!